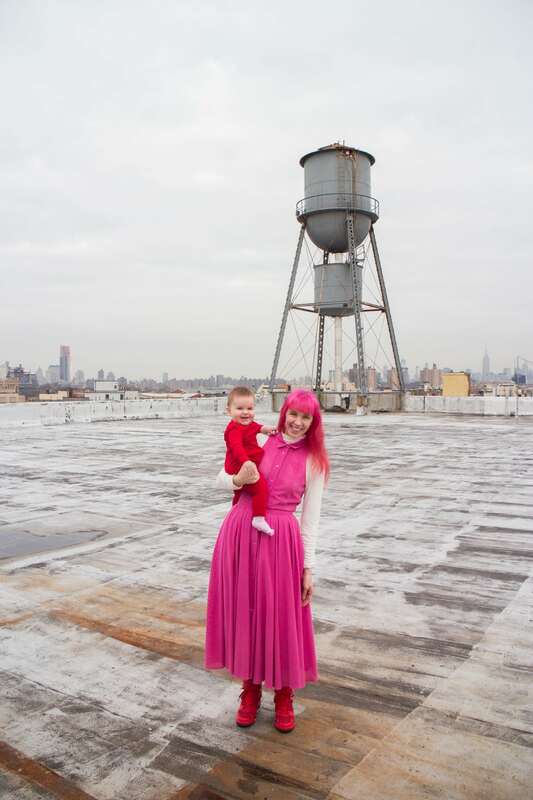 Brooklyn Farm Girl Winter Tea Swap! Goblin and Toes, it’s Chicken Filet time! These are delicious! They taste much better than I imagined. Thank you!! 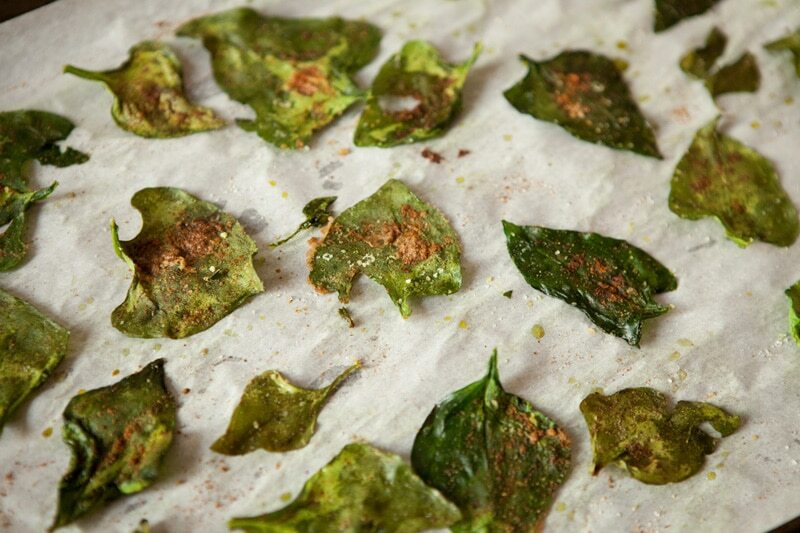 Baked Spinach Chips is a healthy snack made with fresh spinach! This baked recipe is so easy to make! It’s a healthy alternative to potato chips! 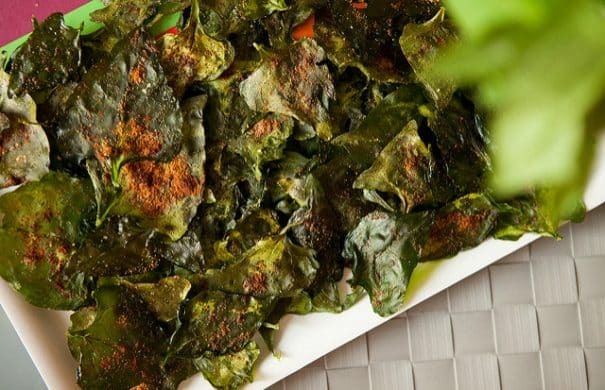 You are probably familiar with kale chips but are you friends with spinach chips? If not, I hope this post will change that. With a overabundance (understatement) of fresh spinach I was trying to come up with unique ways on how to use these beautiful leaves. Then I thought… kale is kinda like spinach in texture.. I wonder if I can make spinach chips? Let me tell you, you can! And honestly, I think these are better than kale chips. The chips just melt in your mouth. I am totally guilty of just wanting to eat a few, then I come back and get a entire bowl’s worth. But it’s spinach so it’s a guilt free snack! I love guilt free snacking, don’t you? So glad you have done this, Pamela. I'm very excited! 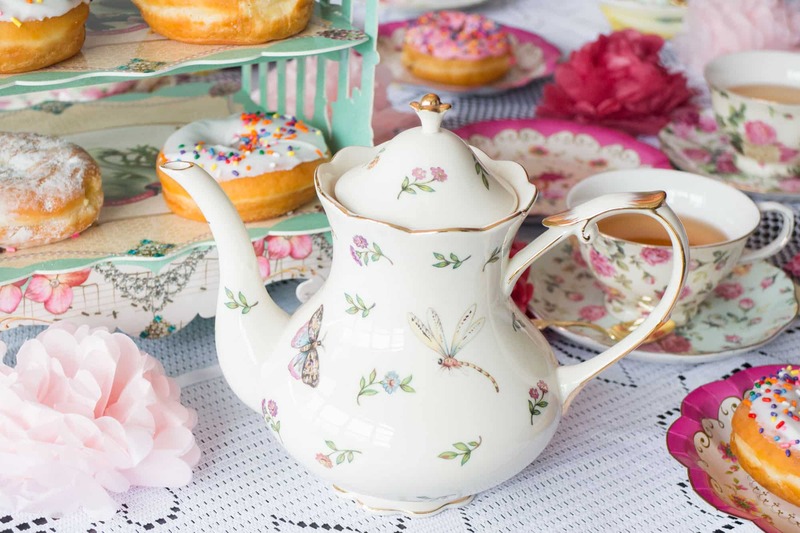 The Brooklyn Farm Girl tea swap is BACK!!!!! After multiple requests from tea lovers around the world I have brought the swap out of hibernation! 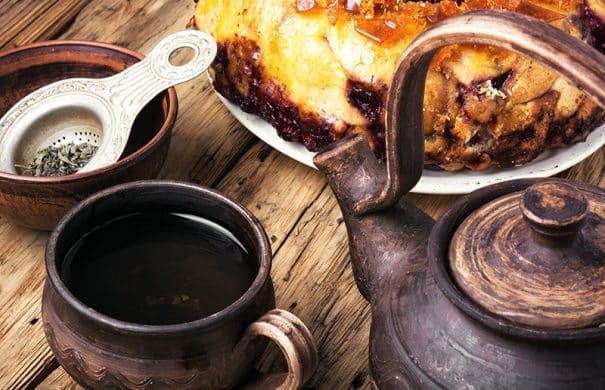 If you love tea, I invite you to join the Winter Tea Swap! Running monthly tea swaps was a little overwhelming and took a lot of planning on my part, so instead I am bringing them back seasonally. I think this is a better idea too since our tea taste changes from season to season! You and a assigned partner send each other a small package filled with different teas to try, a small snack, and a little note saying hello. You can send as much tea as want, but at the very least I recommend sending 10 bags. This allows you to try new teas that you might have never tried. Plus it will be relaxing to sit down at night, read a small note, nibble on a little snack and drink a cup of tea! The entire swap is about meeting new friends, trying new teas and smiling! Great, I’ll give it a whirl & let you know how it turns out. Thank you! 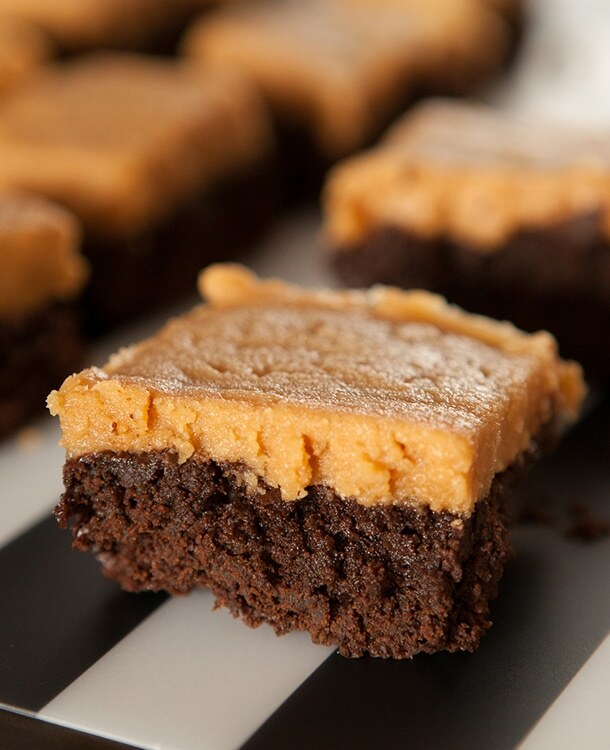 Chocolate SPINACH BROWNIES with Peanut Butter Frosting recipe. This is a EASY way to get kids or adults to eat their vegetables. You won’t believe how delicious these brownies are! 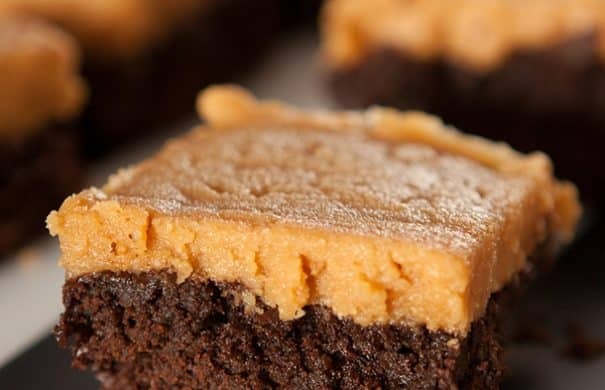 They’re also made with the best peanut butter frosting recipe ever! The color green. What do you think of? In many people’s minds, the color green isn’t something you usually think of when you think of sweet desserts. I hear that little kids fear their green vegetables so sneaky parents have to find ways to incorporate it into their meals. Well I don’t have a little kid, but I still like being sneaky, even if it means just being sneaky to myself. 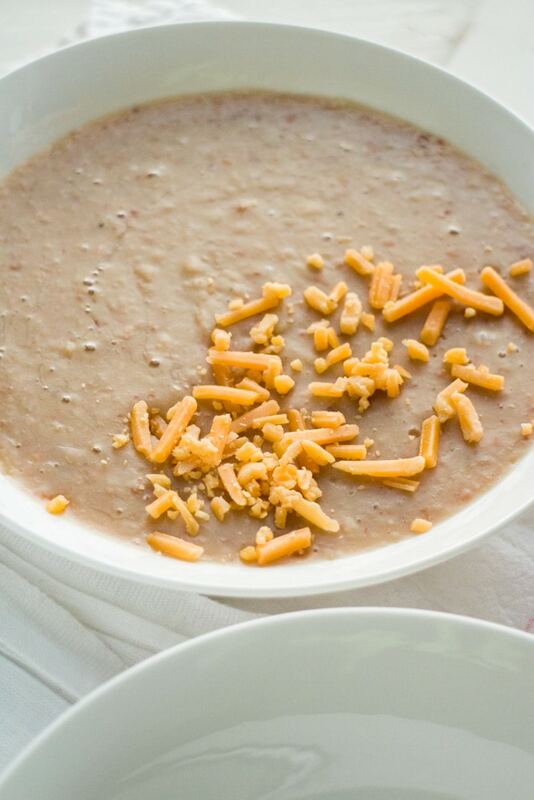 DELICOUS, NO SOAKING REQUIRED, Refried Beans! This easy homemade recipe cooks dry pinto beans in the slow cooker! We always make these healthy crockpot beans for authentic Mexican meals, I will never use canned beans again! Make sure to add shredded cheddar cheese on top! I love refried beans. Not only do they make the perfect side with your favorite Mexican dish (for us, usually tacos! ), but they make a pretty great meal by themselves too! 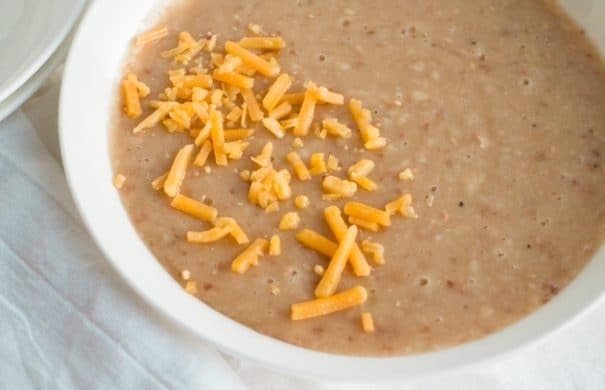 Have you ever had a bowl of perfectly cooked refried beans with a little shredded cheese on top? It’s delicious! These homemade refried beans are made from dry pinto beans. Dry beans are not only super cheap but in my opinion make the best refried beans. 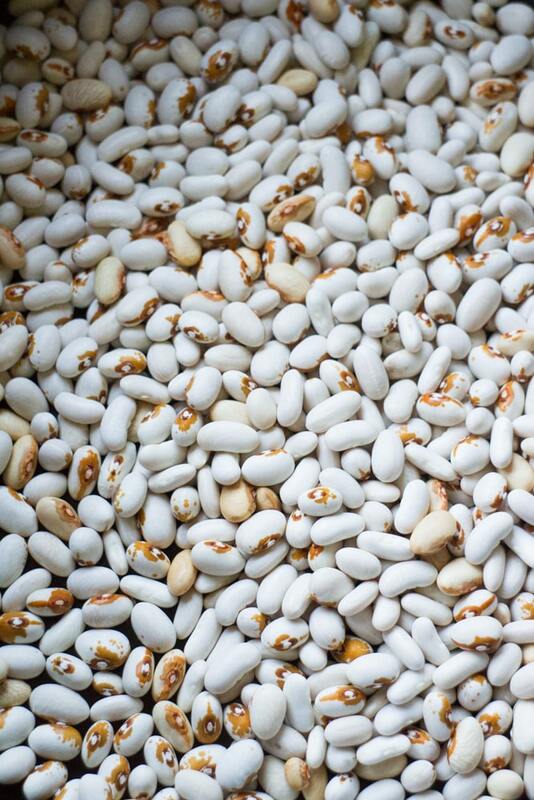 Did you know growing your own dry beans in the garden is easy too? These refried beans are extra special to me because they are made with our own yellow eye beans we grew in the garden last Summer! Feel free to use regular dry pinto beans or yellow eye beans for this recipe, they both make delicious refried beans. 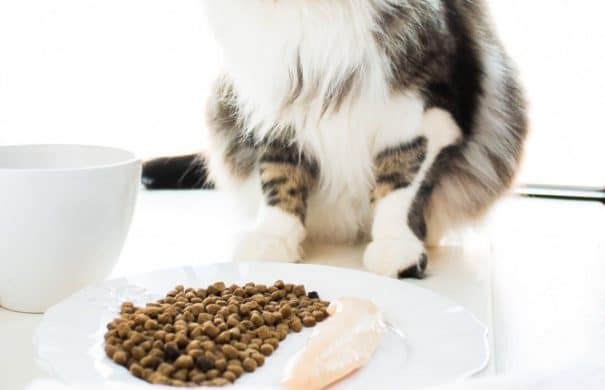 If you’re anything like me, you might spoil your cats. 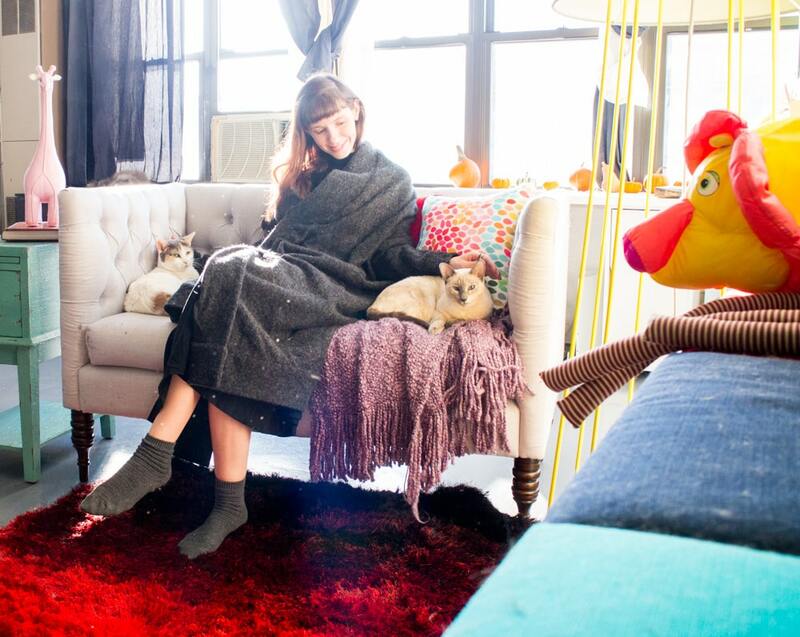 My cats have heated beds, which doesn’t mean anything because they sleep in bed with us. Not only do they sleep in bed with us, but I curl into a little ball so they can stretch out in the bed! During the day if they’re sleeping on the couch I will sit on the floor because I don’t want to disturb them! Occasionally they let me squeeze in between them on the couch for some good ear rubs! 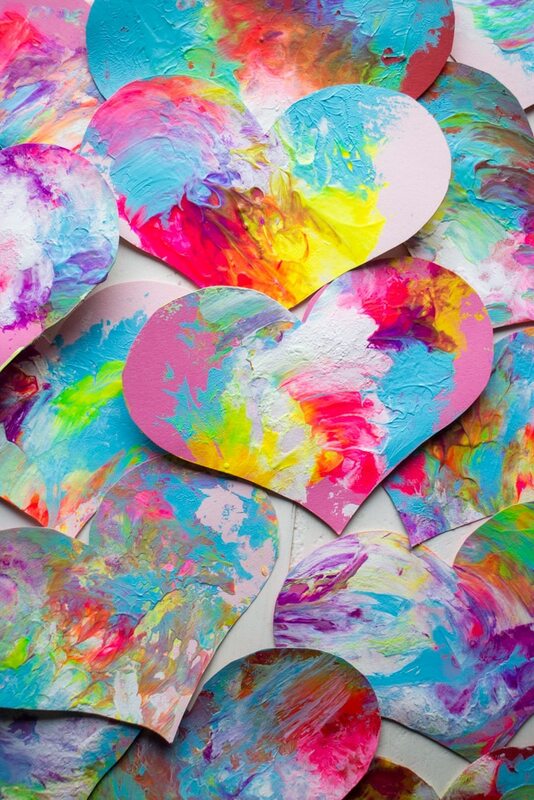 Hey everybody – Happy Valentine’s Day! I have a really special Valentine this year. In fact, it’s her first Valentine’s Day. Her name is Enceladus…. and I’m kinda in love with her! Matthew and I are generally excited about holidays, especially Christmas and Halloween, so I knew when we had a child I was going to go a little Mama crazy with activities and dressing up! 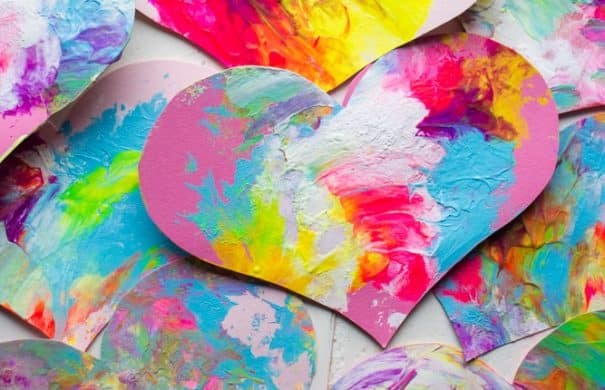 There’s just something in me that screams “I’M SO EXCITED TO DO ARTS & CRAFTS WITH MY BABY!”. 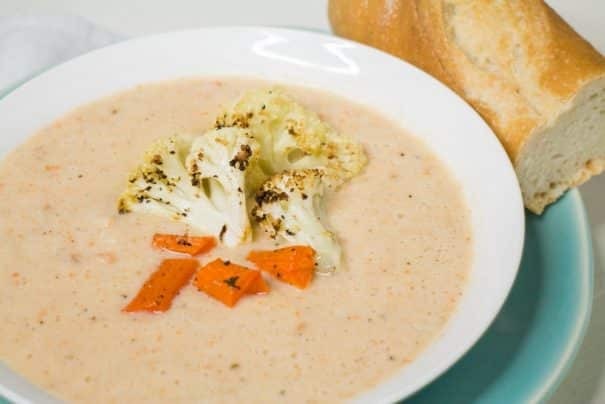 HEALTHY & CREAMY Roasted Cauliflower Carrot Soup! This recipe is loaded with fresh vegetables and is so easy to make! Even though it tastes cheesy there’s no cheese in the recipe – it’s amazing! Recipe can easily be made dairy free by using almond milk. Roasted vegetables don’t get enough love in my opinion. Magic happens when you crank your oven up to 450 degrees, and roll your vegetables around in olive oil. Cauliflower and carrots are good by themselves, but ROASTED cauliflower and carrots? They are amazing! 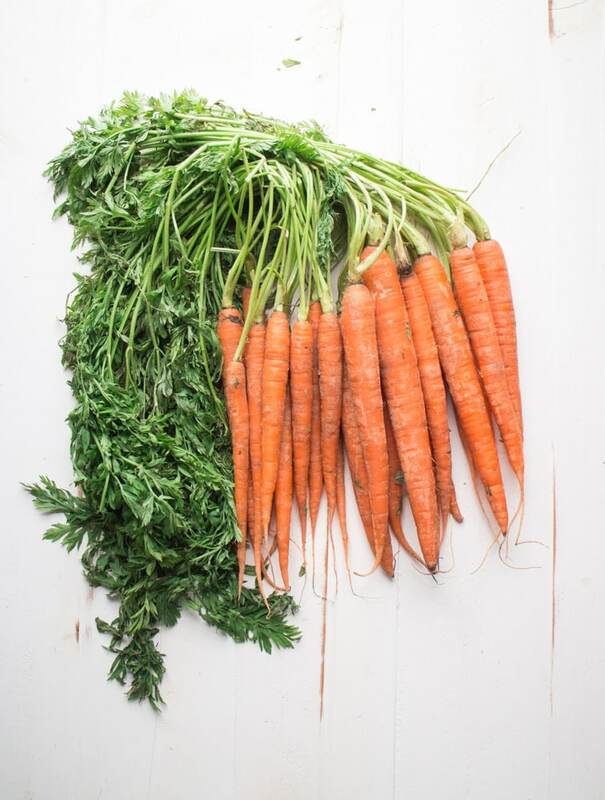 I had some beautiful carrots that I planned on making baby puree with (which I did – with a kick of cinnamon – she loves it! ), but I was left with half a pound of carrots. I took another glance in the refrigerator and saw a head of cauliflower that was screaming to be used. 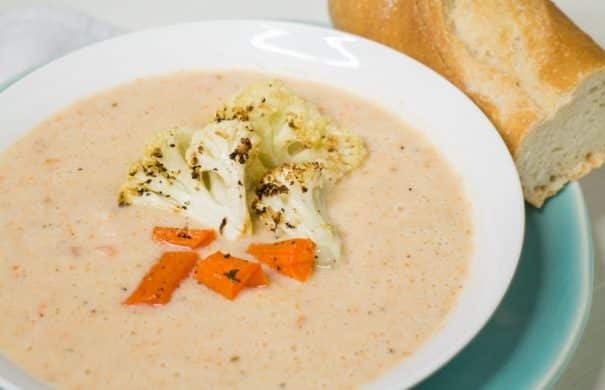 I was feeling in the soup mood so I decided to make my family’s favorite cauliflower soup, but with a carrot twist! This soup is so creamy – but without all the extra fat that usual creamy soups call for! In fact, there is no cheese in this soup! There is only 1 cup of milk, and if you want to make it dairy free you can easily substitute almond milk instead. 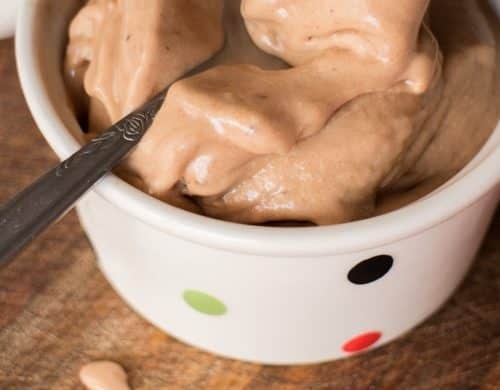 EASY Frozen Banana Ice Cream recipe! 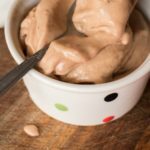 This tastes just like soft serve, no ice cream maker needed! 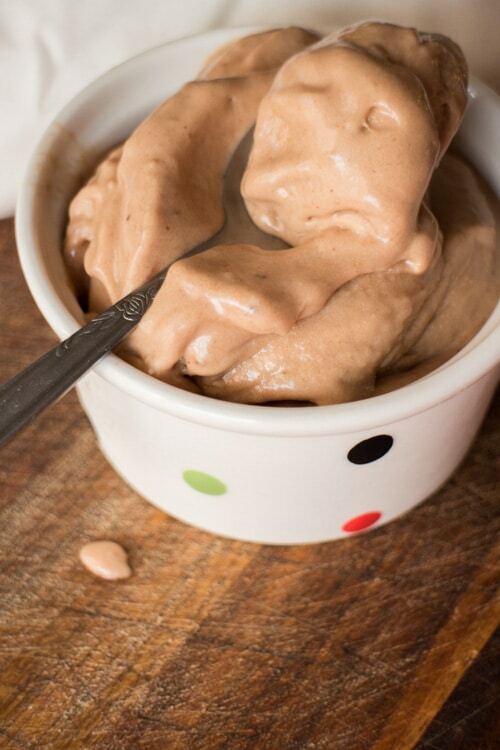 All you need is 3 ingredients: 2 frozen bananas, 1 tablespoon peanut butter and 1 teaspoon cocoa powder. This is the perfect healthy diet ice cream! This Summer I am ice cream crazy. As you heard in another post we got a ice cream maker this Summer. It’s been a beautiful experience and by beautiful experience I mean one full of danger and calories. I’ve bought so many bags of Reese’s Peanut Butter Cups to make ice cream I believe I deserve stock in Hershey’s. But with the ice cream comes calories. Ice Cream With No Ice Cream Maker! Now this Soft Serve Ice Cream is a game changer! You can have delicious ice cream without all the calories! You don’t even need a ice cream machine! It’s so easy to make! 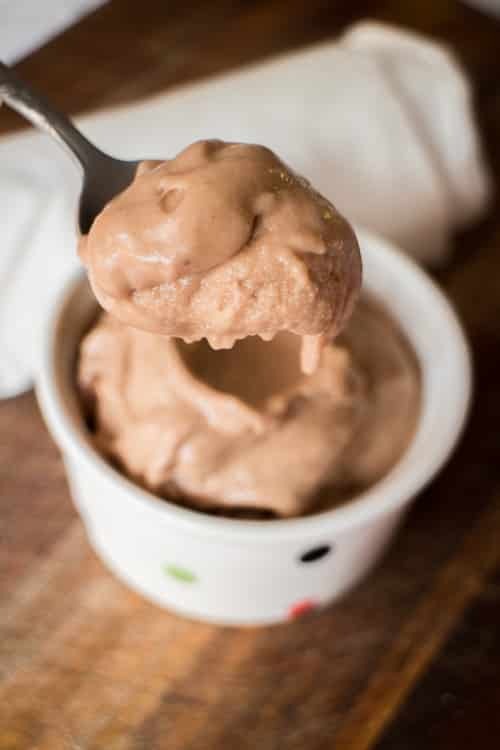 What you need is 2 frozen bananas, 1 tablespoon peanut butter and 1 teaspoon cocoa powder. Then you throw it all in the food processor, give it a few pulses and you have soft serve. I was shocked the first time I made it. I’m talking real soft serve consistency here. I’m talking Ice Cream Truck texture. But without the cream and milk and sugar. Even though it is banana flavored I want to stress it’s not overpowering in banana flavor. I love bananas but I am usually not a fan of anything banana flavored as I always think it tastes overly processed. Not this though. This is just smooth, sweet and perfect. 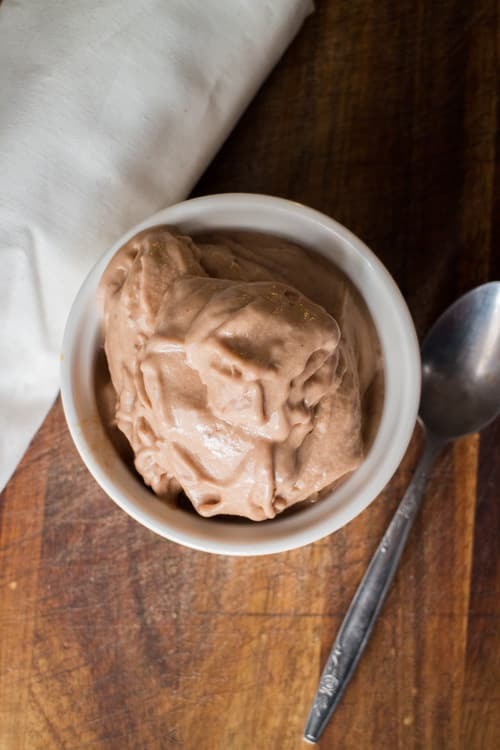 This homemade frozen banana ice cream is life changing guys. Life changing. 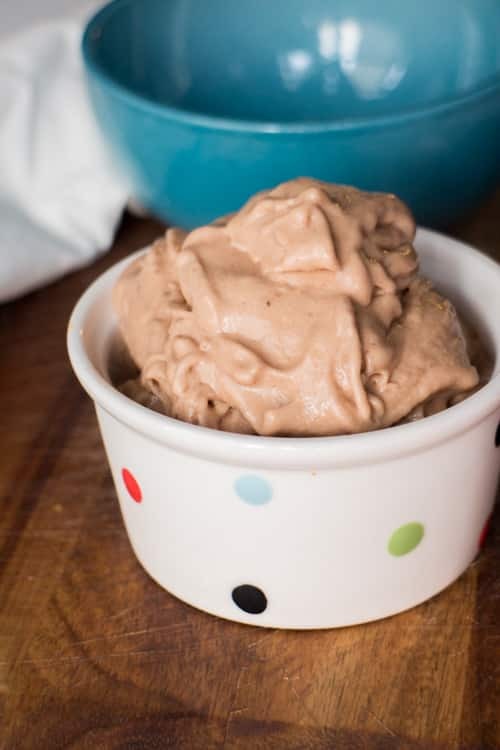 Make some Frozen Banana Ice Cream and enjoy your weekend! Looking for more banana recipes? Try my Chocolate Banana Bread Muffins! Peel bananas and cut them into pieces. I cut each banana in 4 pieces. Add bananas, peanut butter and cocoa powder to food processor. Pulse for about 15-20 seconds or until frozen soft serve consistency. Serve right away or put in container to store in freezer. 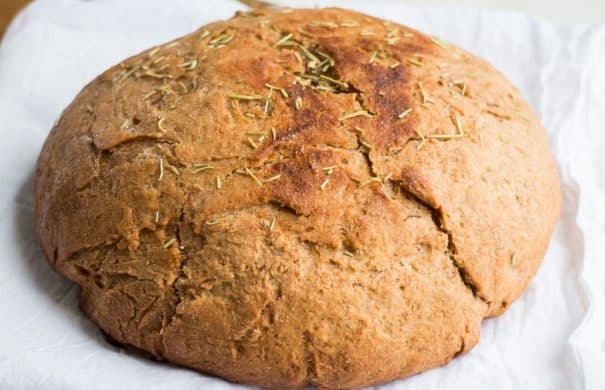 Homemade Whole Wheat SLOW COOKER Bread recipe that’s so easy to make! 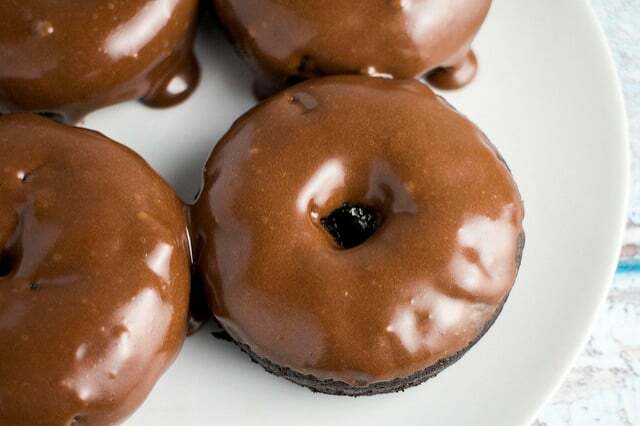 This simple recipe is made in the crock pot and uses honey instead of sugar. 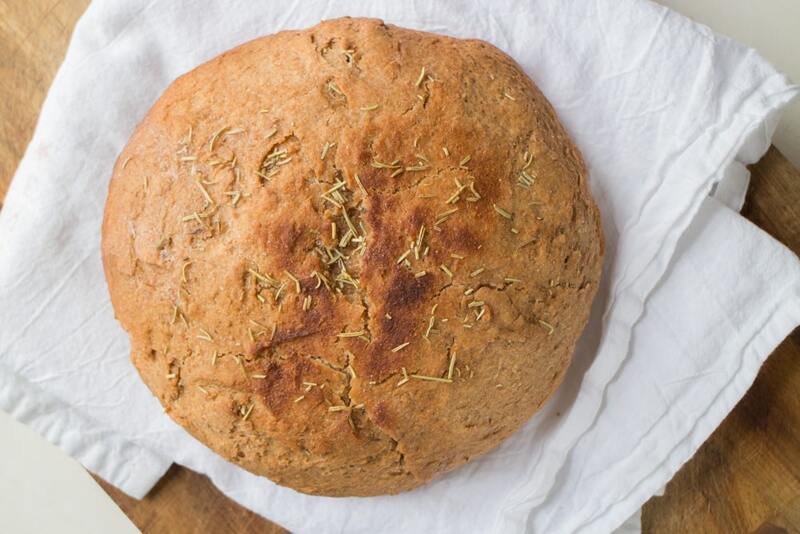 This bread is healthy and great for clean eating! Use it for sandwiches or for breakfast, I love mine with a little butter and jam! Remember my 2 Hour Slow Cooker Bread? I had a few requests for a Whole Wheat version so I baked my heart out one weekend and made this Whole Wheat Slow Cooker Bread, also made in 2 hours! If you’re anything like me, then you love bread. No, you don’t just love bread, you LOVE LOVE bread. I am pretty sure bread is up there in my top 5 favorite foods of all time. Bread is perfect for sandwiches of course, but it makes the perfect partner for a creamy casserole. 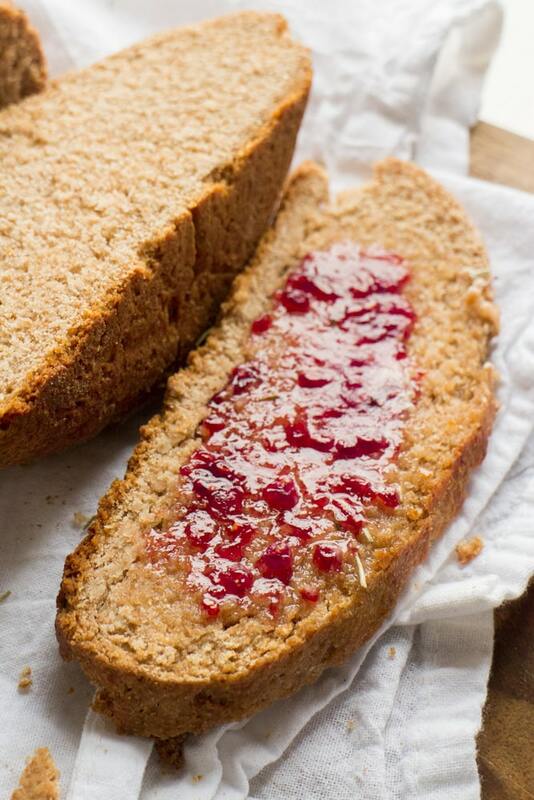 One of my favorite quick breakfast meals is a slice of bread with butter and raspberry jam on it! It’s perfect! Hey Birt, I like Pacific and Knorr broths. 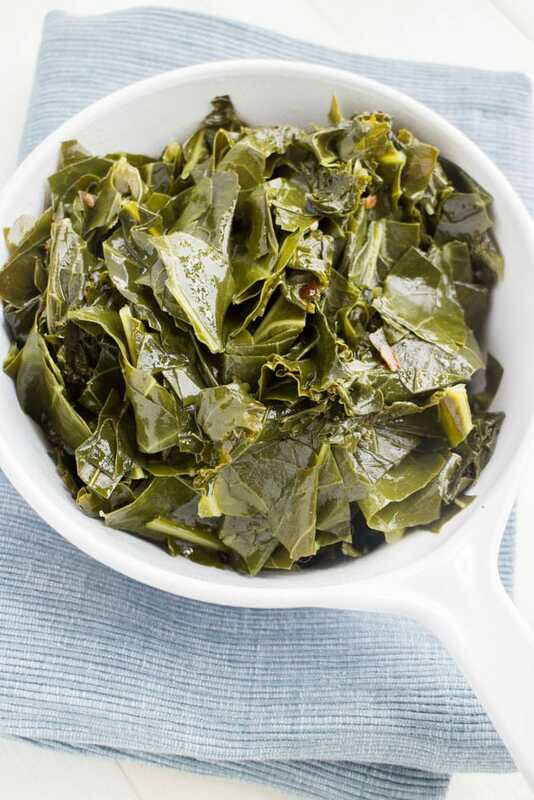 Easy Vegetarian Collard Greens recipe. These greens are simmered in a brown sugar vegetable broth making them full of flavor! With lots of greens to pick in the garden we are having a side dish of collard greens weekly at the dinner table. I love these collards so much I’ve been making a big batch to take to work to eat for lunch a few times a week (partnered with some cheese/crackers because I love a mismatched lunch). So many Collard Greens recipes call for chicken broth or ham hocks, but in this recipe I’m using vegetable broth to make it Vegetarian friendly. I’m adding a little bit of brown sugar into the vegetable broth to balance out the natural bitter flavor that collards give, but not making it too sweet. 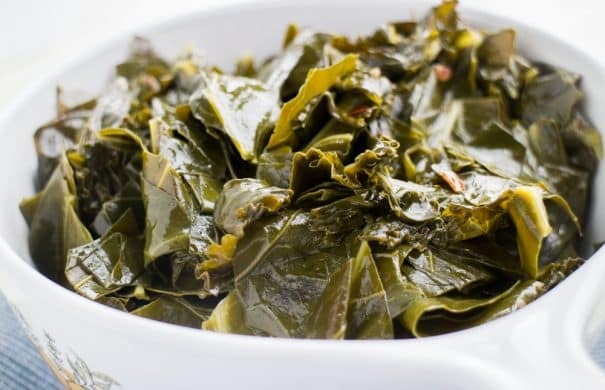 Years ago I had some of the best collard greens in North Carolina at a Mom and Pop style restaurant. I was shocked to find out these weren’t made with meat so I made it a goal to come up with a equally delicious recipe I could make at home!